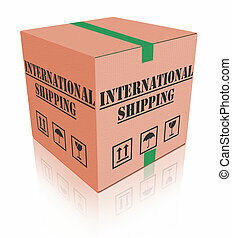 Global shipping services. 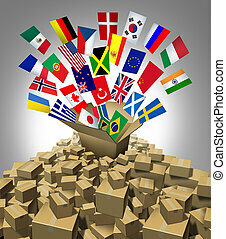 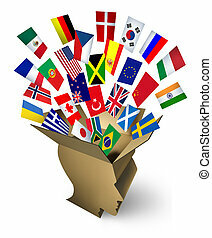 Global shipping and freight services and worldwide delivery transport with an open cardboard cargo box and flags from around the world flying out on a white background. 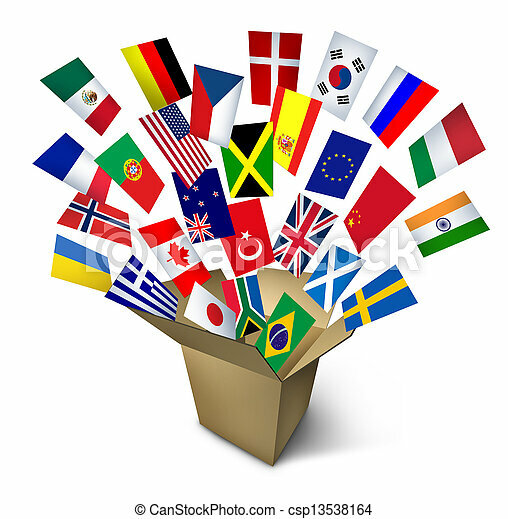 Global shipping and freight services and worldwide delivery transport with an open cardboard cargo box and flags from around the world flying out on a white background. 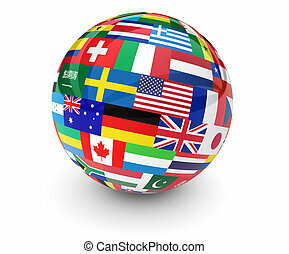 Flags of the world on a globe for international business, school, travel services and global management concept 3d illustration on white background. 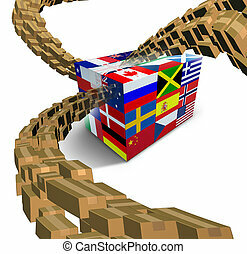 conception of world trade. 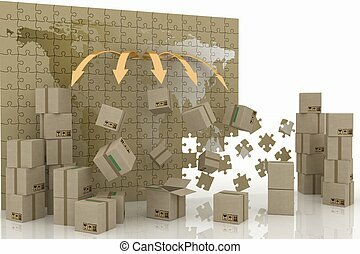 3d concept of logistic. 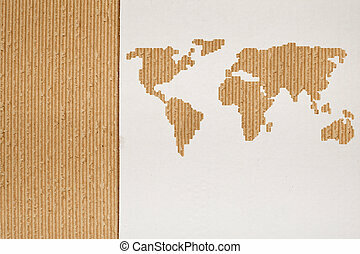 Full length portrait of smiling delivery worker carrying a big cardboard box from stack, global shipping and delivery over world map sketch. 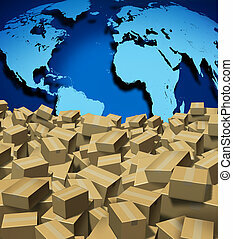 Mail order distribution. 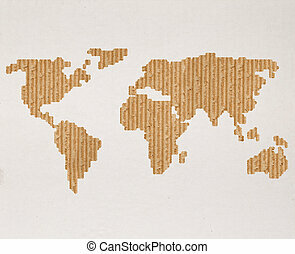 Global Shipping and cargo concept as a worldwide trade and delivery transport courier service with a world map from internet sales with a group of shipped cardboard boxes. 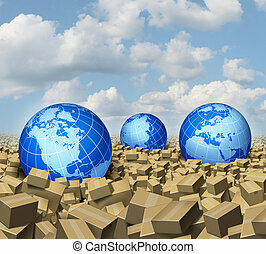 Global delivery Shipping and international package sending as a world parcel concept made of a mountain of cardboard boxes as a volcanoe with a group of flags as a symbol of fast service. 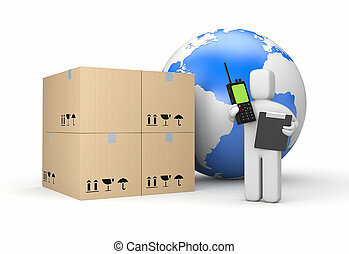 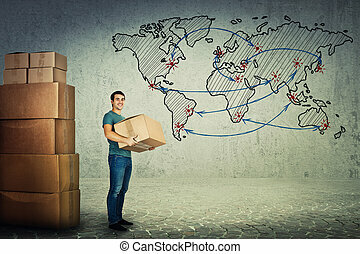 Global shipping management package delivery with a world sphere of north america and an open cardboard box in the shape of a human head as managing freight distribution and transportation of goods. 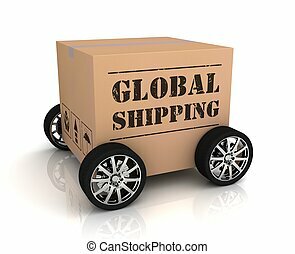 Global shipping solutions and delivery concept with an open package cardboard box shaped as a human head with flags of the world streaming out as a transportation and freight strategy icon of international business and trade. 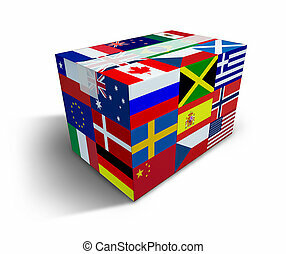 Global Shipping and worldwide delivery transport courier of international goods from internet sales and cargo transportation as a box with flags from across the world and tape closed with shadow on a white background. 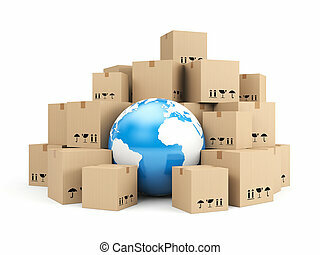 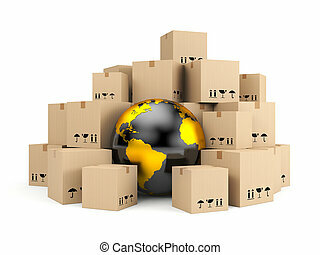 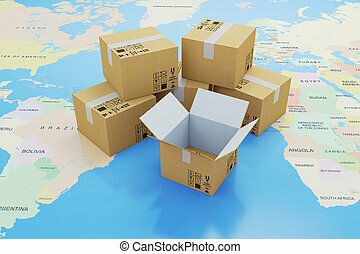 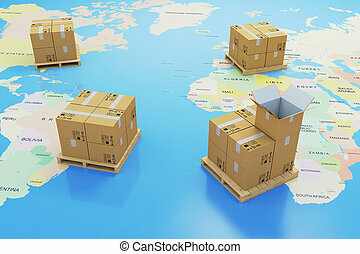 International shipping and global freight delivery services business concept with a streaming group of packages as cardboard boxes flowing into a blue sphere of the map of the earth isolated on a white background. 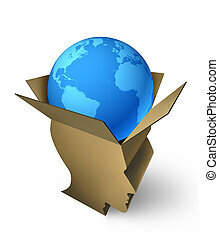 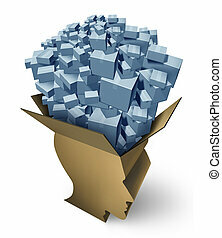 Intelligent shipping as a global package management delivery service or gift ideas concept as an open cardboard box in the shape of a human head managing freight distribution and transportation of goods on a white background. 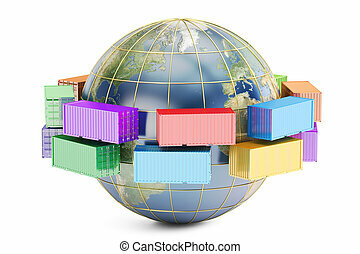 Global cargo and Shipping business concept as a worldwide trade and delivery transport courier service with a group of spheres representing the world markets floating or drowning in a sea and ocean of cardboard boxes. 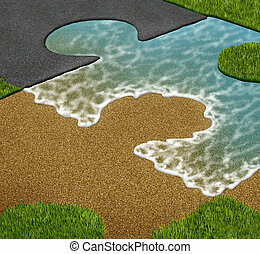 Global connection and world trade collaboration as a business concept of international partnership and team network as a jigsaw puzzle connected together with a sandy beach ocean land and urban road as a symbol of transportation services. 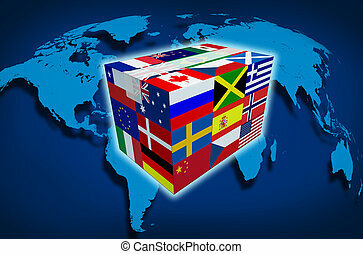 Global Cargo and Shipping and worldwide delivery transport courier of international goods with a world map from internet sales and cargo transportation as a box with world flags and tape closed with shadow on a white. 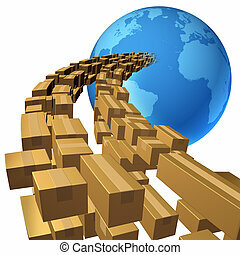 Global delivery with a package box printed with flags from the world and streaming groups of cardboard boxes flowing to the center as a transportation and shipping freight symbol of international business on white. 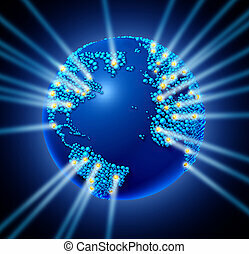 Global network world with the international map in the shape of small spheres with glowing laser lights as a technology icon and communication connections on a black background. 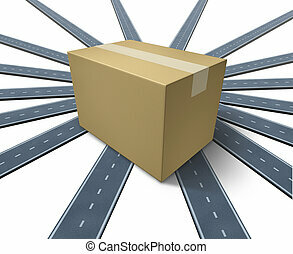 Shipping everywhere and anywhere transportation concept as a three dimensional cardboard package sitting on top of a group of roads and highways going in all directions on a white background. 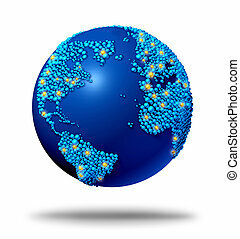 Global connections and communications symbol concept with a blue international globe of the worldmade of small globes around a sphere as a social exchange and trade icon for imports and exports. 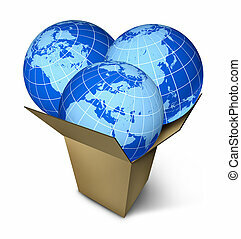 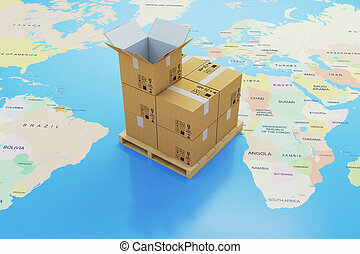 World parcel shipping and international package delivery business concept with an open cardboard box containing three global spheres of Asia North America and Europe on a white background.